Sports fans love Indianapolis for its state-of-the-art facilities and year-round events dedicated to the game. From its popular attractions to its smaller-scale points of interest, this metropolis offers so much for sports enthusiasts, whether you’re testing your skills hands-on or cheering for your favorite team. With that in mind, here are some of the best spots in Indy for sports fans. Indianapolis Motor Speedway is famous for hosting the 200-lap Indy 500, but did you know it also lets you hop aboard a race-winning car and speed across its 2.5-mile track? While there you can also take an informative tour of the grounds and visit the on-site museum housing antique cars and a variety of motorsports memorabilia. Be sure to keep aware of annual events, too. The facility often hosts concerts and music festivals, as well as different racing events, including autograph sessions with current and former drivers. And for children, the Indy Motor Speedway sponsors a kids’ club where youngsters can meet other race fans and participate in fun activities. Baseball fans will enjoy a trip to Victory Field. It’s well-known for hosting numerous events throughout the year, including high school sports competitions, Indiana University baseball games, and 70 home games for the Indianapolis Indians — the city’s professional minor league baseball team. You can also stop by for an autograph session with current players, have fun with themed night games, and sign your kids up for the annual youth baseball clinic. Also, don’t forget to take a lap around Victory Field. Tours run on Tuesdays and Thursdays from April to September and take you past areas like the clubhouse and training room. 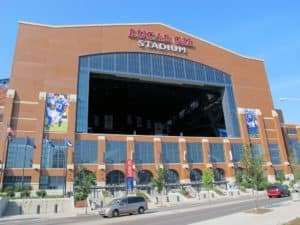 Capable of seating more than 67,000 people across seven levels, Lucas Oil Stadium has more than enough space for big events and enthusiastic fans. In fact, it hosted Super Bowl XLVI and has housed the Indianapolis Colts since 2008. It also lends its space to collegiate athletic tournaments, band competitions, concerts and conventions, and both local and national sporting events. Want a behind-the-scenes look at Lucas Oil Stadium? Take a 90-minute public tour of the facility while making a stop at the playing field and NFL locker room. Want to see Super Bowl MVP Peyton Manning? In front of the stadium on South Street sits a statue with jersey number 18 in honor of the quarterback who played for the Indianapolis Colts from 1998 to 2011. If your love of sports spans different games, Sportzone Indy has just the playing field perfect for visitors of all ages. This fun indoor facility features 3 acres of turf divided into areas suitable for sports such as basketball, football, lacrosse, soccer, volleyball, and ultimate frisbee. It also offers a 40,000-square-foot softball and baseball field with a drop-down dugout and batting cages. If you’d prefer to watch, Sportzone offers bleachers for spectating and cheering on your favorite players. In addition, a 5,000-square-foot fitness room offers the perfect outlet for sports training, while an MVP section features various collectibles, trading cards, and signed memorabilia for guests to explore. With so many places in Indy dedicated to sports fans, which destination will you visit first?